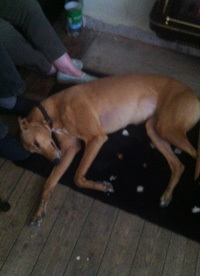 Went to her new home on Thursday 28th June 2012. 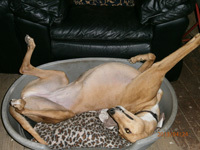 Rosie is a lovely dark fawn ex-racing greyhound who was born on the 21st March 2008. Although having been raced she has lived in a home, and is house trained, spayed, inoculated and microchipped. 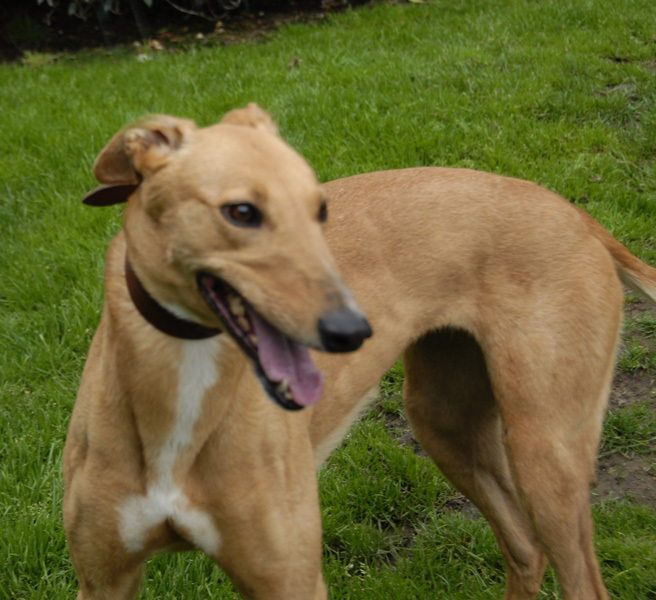 She has a lovely nature, enjoys a cuddle and loves playing with Joey who she lived with. She walks nicely on the lead, travels well in the car and from what we've seen so far she is okay with children and other breeds of dogs. 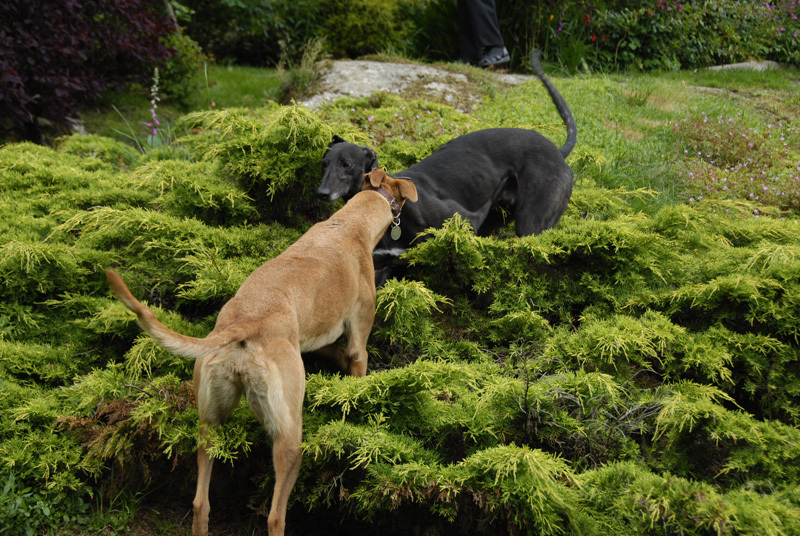 This morning Rosie arrived with Joey, both were kept on the lead while we introduced them to the garden to do their toilet then let our greyhounds out one at a time to say hello to them. All the greeting done and we brought them in the house where they could settle. This morning Rosie took a trip to the vet to be spayed and have her 1st inoculation because she came with no paperwork. All went well and we collected her in the afternoon. She spent a quiet evening and ate a little before settling down for the night. This morning as Wendy, another fosterer was passing to take Alice to be spayed, she collected Rosie and took her to the vet at the same time for her second inoculation, dropping her off again on the way back. At lunch time the family interested in re-homing Rosie came to visit her, complete the adoption paperwork and take Rosie home with them. Once everything was complete she walked down the drive with them and with a little help from us jumped into the back of their car, settled down and off she went to her new home where we hope she will have a long and happy life. We received a phone call asking if we could have Rosie back because one of her owner's died recently and because of the faiing health of her other owner it was felt in Rosie's best interest she be returned so we can find her a new forever home. Arrangements are in place for her return. Rosie is a lovely dog, is okay with other breeds of dogs and smashing with children, but she doesn't like cats! Rosie came back into 'rescue' this afternoon and is being fostered by Flower and Colin who adopted Flower. Rosie will stay with them until we can find her a new forever home. Flower and Colin brought Rosie to our home today because we have a lady interested in adopting her. The lady came with her family and all being well she wants to take her home with her today. When they saw Rosie it was instant 'love and first sight'. All the paper work signed and sorted, and off Rosie went with them to her new home where we hope she will have a long and happy life. 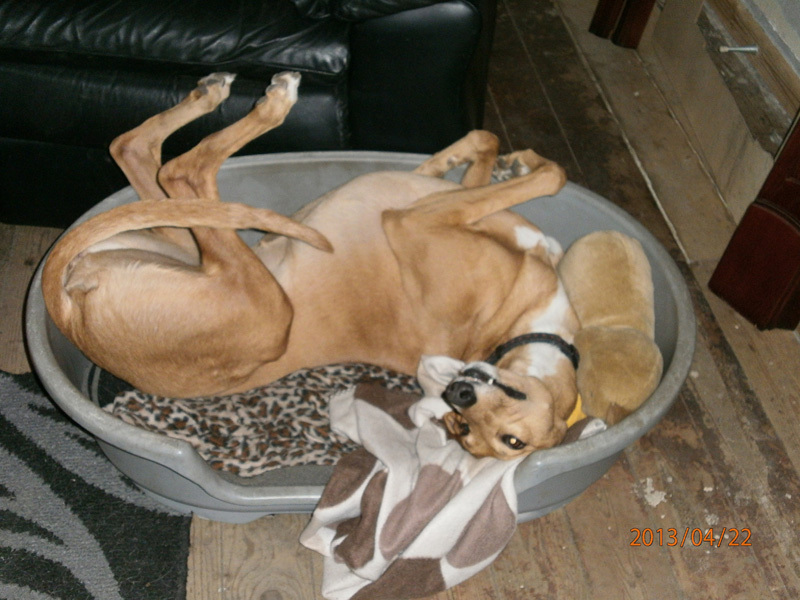 We heard today that everyone would think that Rosie had been in her new home all her life! She is so biddable and when it comes to sleeping she allows her owner a lie in if she wishes. She has had a great run around the garden this afternoon with Diane's two. Not many grumbles from any of them!! 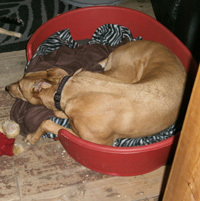 Heard today that Rosie is so well settled, she gets on well with Diane's dogs and her owner's grandson's collie pup. Like her owner Rosie is quite happy to lie-in in the mornings!! 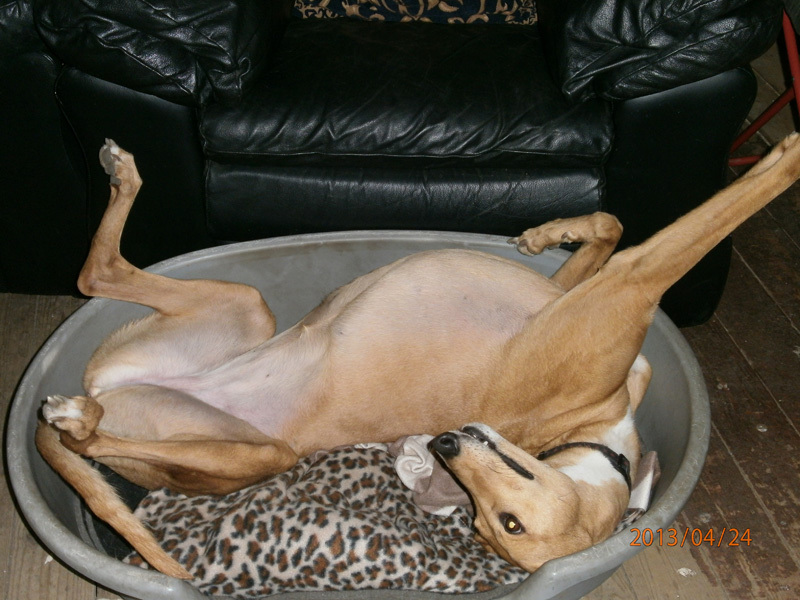 We received an email today letting us know that Rosie's owner thinks she is beautiful. She loves her to bits and you would think she had been in her new home all her life. She says she has certainly got a dog in a million with Rosie. She is sooooo good, she's incredible. We received a card today letting us know that Rosie has settled in well, she loves the garden as there is plenty of room for her and her two friends Prince and Jess to run around. Rosie is still doing well. She is such a character, has crazy times and LOVES her food. She would eat anything and sometimes does. It was gooseberries off the bushes yesterday!! Rosie went to her owner's local show and she won 3rd prize in the 'all breeds' section and 2nd prize in the 'children's pet' section. Both classes had big entries. Her owner's grand daughter took her round the ring and Rosie was so good. Took everything in her stride and was happy to see the other dogs. We heard today from Rosie's owner saying she is the most brilliant companion she could ever have. She is so gentle, loving and scatty like her owner at times. She'll never stop wondering how she could have been matched so well. 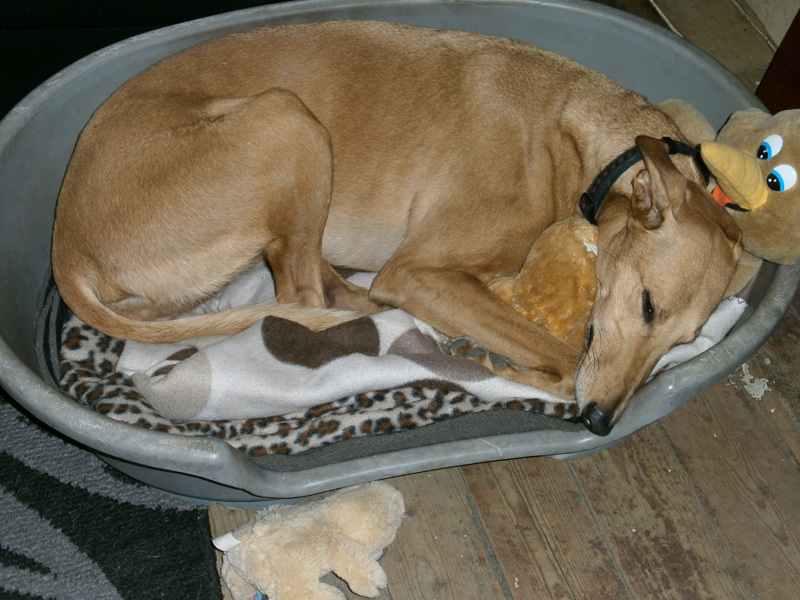 We received an email today from Rosie's owner saying she couldn't have wished for a better companion. Rosie is so placid, faithful and funny. A real character. At the moment her owner is waiting for a new hip and can't walk Rosie, but the field outside her garden has no sheep in at the moment so she leaves the garden gate open and Rosie has the run of the field which is secure. When other dogs come past she runs up and down the fence with them and her grandson has two collies who visit. She also is very good at sleeping, doesn't get up too soon!! She would eat all day if she could. She's so fit and healthy. We heard today that Rosie won first prize in the all breeds section of their local show on Saturday with a lot of competition, then she went into the children's pets section and won second prize. Her owner is so proud of her.